Podcasts have been making serious gains in popularity over the last few years. In 2014, only 15% of individuals reported listening to audio podcasts each month. Four years later, that number has jumped to 26%. It’s not surprising that podcasts continue to grab more and more attention. They’re easy to listen to while commuting or around the house, and there’s a topic on just about everything – including talent and recruitment. Podcasts are a great tool for expanding your recruitment skills, learning something new about talent acquisition, and ultimately growing your career – all without having to spend a dime or leave the comfort of your home. There are hundreds of podcasts out there, so to save your time and help you find a show you’re sure to love, here are ten of our favorite recruiting podcasts you should subscribe to in 2019. Hire Up with John P. Beck, Jr.
Jörgen Sundberg, CEO of Link Humans and creator of the blog Undercover Recruiter, is the host of The Employer Branding Podcast, a show that delivers 20-minute episodes following a question and answer format. The show centers around building an employer brand and how to use your company image in talent attraction and recruiting. The Employer Branding Podcast features professionals from leading companies, such as Walmart, GE, and Salesforce, as well as startup challengers using unique strategies to stand out – giving listeners useful advice regardless of their industry or organization size. We love The Employer Branding Podcast for its ability to go both broad and deep into the benefits of employer branding. Just scroll through some of the show titles and you’ll find tips for attracting everyone from truckers to recent college grads. New episodes are available weekly on iTunes, SoundCloud, and the Link Humans website. The problem with many professional podcasts is that they sound like a lecture. They may be full of useful information, but they’re boring. Rather than retaining insights or tips, you find yourself zoning out – but not with The Chad & Cheese Podcast. Chad & Cheese is not your typical recruitment podcast. They bring a unique perspective to recruitment news, filled with snarky commentary and opinions they’re not afraid to share – so much so they’ve gained a Parental Advisory label. We love that Chad & Cheese isn’t afraid to “punch the recruiting industry right where it hurts.” They’re not afraid to ask the difficult questions or make a controversial statement, all while putting on a great show packed with helpful information. There doesn’t seem to be a clear posting schedule for The Chad & Cheese Podcast, but they upload new shows at least once a week. Subscribe on iTunes, Spotify, or Google Play so you don’t miss an episode. On The Jim Stroud Podcast, host Jim Stroud shares quick thoughts and insights on how cultural trends and emerging technology are influencing the world of work. Each episode is about ten minutes, so they’re easy to consume between meetings or while taking a screen break. Jim Stroud brings his experience consulting for Microsoft, Google, Siemens, and a series of startup organizations to provide information-packed shows techies will love. The Jim Stroud Podcast is great for recruiters who can’t get enough of technology and computers. The Jim Stroud Podcast earns a spot on our list because of its future-focused perspective. Jim uses his podcast to look ahead at how the industry is changing, connecting his ideas to present-day challenges. New episodes of The Jim Stroud Podcast are uploaded weekly, available on iTunes, Spotify, and Anchor. 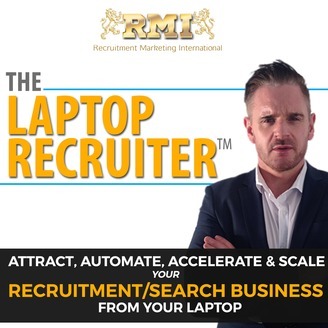 Andy Whitehead created The Laptop Recruiter podcast with aspiring recruitment business owners in mind. Not only does The Laptop Recruiter share how to attract and connect with high-quality talent, but it also teaches important lessons on growing a small business. Even if you’re not looking to create your own recruitment business, The Laptop Recruiter can provide you with tips for working more efficiently, making strong network connections, and provide a better experience for candidates. We added The Laptop Recruiter to our list because it provides great insights for any recruiter wanting to advance their career. By going beyond simple lessons on how to recruit better talent, The Laptop Recruiter encourages listeners to be a better recruiter in all ways. New episodes of The Laptop Recruiter are uploaded irregularly, but you can subscribe on Stitcher or iTunes to get notified of new shows. Invisibilia isn’t a recruitment podcast per se – but it is a podcast about human behavior. Each episode explores different behaviors, reactions, and ideas and breaks down why individuals act that way. While you won’t get recruitment lessons from Invisibilia, you can learn a thing or two about people – something you need to understand in the recruitment industry. By taking the time to remember that candidates are just regular people, you can build better relationships that lead to better hires. Despite not really being recruitment podcast, we added Invisibilia to our list because it provides an interesting perspective on human behavior. Its stories can provide an interesting perspective that helps you think differently. Invisibilia is currently between seasons and uploading sporadic bonus episodes. You can listen on the NPR website, iTunes, or Spotify. IdeaCast is a business and management podcast brought to you by Harvard Business Review. While HBR IdeaCast is another that falls loosely in the “recruiter” category, episodes cover everything from miscommunication blunders and networking myths to using AI to make decisions and challenges minorities face in the workforce. IdeaCast is hosted by Sarah Green Carmichael, an executive editor at HBR. She frequently brings in experts such as university professors, consultants, and C-suite executives, but also features high-profile guests like former U.S. Secretary of State John Kerry and former U.S. President Bill Clinton. IdeaCast made our list because it shares a unique perspective on business as a whole, allowing recruiters to better understand how employees can fit within an organization’s big picture strategy. HBR IdeaCast is a weekly podcast. You can listen and subscribe on the HBR website, iTunes, or Google Podcasts. Recruiters face a unique challenge by needing to understand the ins and outs of a position they’ve likely never held. They need to understand the skills to look for in the position they’re trying to fill, as well as be prepared to answer any questions the candidates may have. Slate’s Working podcast does an excellent job at diving deep into various positions, giving listeners a better understanding of what it really takes to get a job done. The jobs range rather broadly, covering everything from Google Coders to Professional Wrestlers. The Working podcast provides a fun way to look at work. Even if you’re not hiring for a Comic Book Librarian or a Marijuana Farmer, you can gain a unique perspective on the different day-to-day task different professionals perform each day. New episodes are uploaded weekly on iTunes, Google Play, and Spotify. Pablo Fuentes, CEO of Proven, shares weekly stories about small businesses across the US with the Small Business War Stories podcast. Pablo asks guests to provide the highs, lows, and funny moments of creating and growing a small business. 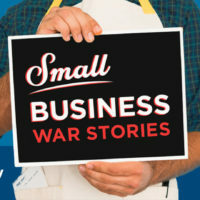 Like many others on this list, Small Business War Stories isn’t specifically a recruitment podcast, but it does touch on staffing, hiring, and employees pretty often. We added Small Business War Stories to our list because it helps recruiters discover the various pain points and needs everyday small business owners face, providing them with a better platform for recruiting the right talent. Proven releases new shows every week on iTunes and Stitcher. Hire Up with John P. Beck, Jr. is a podcast dedicated entirely to how the right employees can help you grow a successful and sustainable business. John explores various business ideas with his guests over the span of 30 to 60 minutes, including topics such as workforce data and Corporate Social Responsibility. Many of his guests are within the tech industry, but it’s still a great listen for recruiters all over the map. Hire Up made it on our list of favorite podcasts because of John’s dedication to sharing knowledge and having fun while he’s at it. New episodes are released every few weeks, but you can subscribe on iTunes or Stitcher to never miss a show. Matt Alder makes our list of best recruitment podcasts yet again with Recruiting Future. As one of the leading recruitment podcasts out there, Matt gives a high-quality episode each and every week. Recruiting Future is dedicated to exploring innovation and futurology in recruitment and HR, interviewing thought leaders and professionals who are changing the hiring industry. Each episode is about 25 minutes, making it perfect for a commute. We added Recruiting Future to our list for the second year in a row because of its consistency, high-quality guests, and awesome insights. New episodes of Recruiting Future are uploaded every week. You can subscribe on the Recruiting Future website, iTunes, or Stitcher. There’s a podcast out there for everyone, you just need to do a bit of listening. Whether you’re looking for lessons on how to advance your career or you want to hear some interesting stories on human behavior or the world of work, this podcast list sets you up with literally hundreds of episodes to get you started. And if that’s not enough for you, check out this list of 12 more recruiting podcasts. And remember – one of the best parts about listening to podcasts is talking about podcasts. Be sure to share your favorites and get new recommendations from friends and team members!